Since we last wrote, rural communities in Delaware, Maryland, Virginia, Kansas, Illinois, Wisconsin, Pennsylvania, Iowa, and Virginia have been threatened by new factory farms. The SRAP team has been working overtime to empower citizens to stand up to the greed and corruption of corporate agribusiness – and we’ve had success this month! In Sterling, Nebraska, for example, we received word that a proposed 88,000-bird broiler complex has withdrawn its permit after SRAP board member Dr. John Ikerd traveled to the community and spoke to residents about the impact of factory farms on the local economy. You can read an account from community member CH Hagstrom here. Also in Nebraska, our very own Craig Watts traveled to Fremont and the surrounding communities to talk about his experiences as a contract chicken producer with the poultry giant Perdue. Working with Nebraska Communities United, Farm Aid, and GC Resolve, Craig connected with Nebraskans who were considering going into the contract chicken business to supply birds for the new Costco chicken operation that’s planned for construction in Fremont. News coverage can be found here and here. Citizens we’ve been working with in Minnesota also received good news, as an industry-backed bill called the Farmer-Neighbor Mediation Act hit a wall in the State Legislature and lost momentum. Had the bill passed, it would have required neighbors of factory farms to enter into mediation with the operation before taking action in the courts. We’ve also seen progress in the Illinois legislature, where lawmakers are working with neighbors and farmers to put stricter rules in place for new factory farms. Currently, loopholes in the existing law make it easy for new factory farms to be built, leaving virtually no tools for neighbors who are concerned about the harmful impacts of these new facilities. Serious kudos to our state-affiliate Illinois Citizens for Clean Air and Water (ICCAW) for their massive organizing effort to communicate the needs of impacted farmer and rural community members to lawmakers, which is why the this legislation is getting some legs. All is not rosy in Oregon though as the eastern end of the Columbia River Gorge is about to get a lot stinkier. The state just allowed another 30,000-cow mega dairy to begin operations, despite the fact that Oregon’s family dairies have been on the decline since the first 70,000-cow mega dairy came into the state in 2000. Organic dairy farmer Jon Bansen isn’t pleased. With the arrival of the new operation, a coalition of local groups has been pushing the state to legislate air rules that would require the operation to mitigate emissions. Until next month, be well, stand tall, and keep fighting to protect our rural communities from factory farm pollution. If you’re interested in seeing specific items covered in our newsletter, send your suggestions to news@sraproject.org. Brian Kaltreider had returned to his roots. Life in his grandpa’s rural hometown of Codorus Township in York County, Pennsylvania, was the plan — complete with the long-awaited restoration of an 1864 log cabin Brian had in storage. There was plenty of work to do on the structure, including the addition of 150 tons of stone to build out the foundation. It was going to take some time, but it was worth it. Codorus Township was where the cabin belonged, and where Brian wanted to be. It was also where Hillandale Farms, one of the nation’s largest corporate egg producers and distributors, decided it wanted to be, too. Hillandale bought an existing egg-laying facility and egg-washing operation about 1/3 mile away from Brian’s property and quickly expanded its size while backing the original owner to buy more and more land for growth of the business. There were times when manure mishandling at the original operation kicked up some odors from fields behind the house, but nothing like it was now. 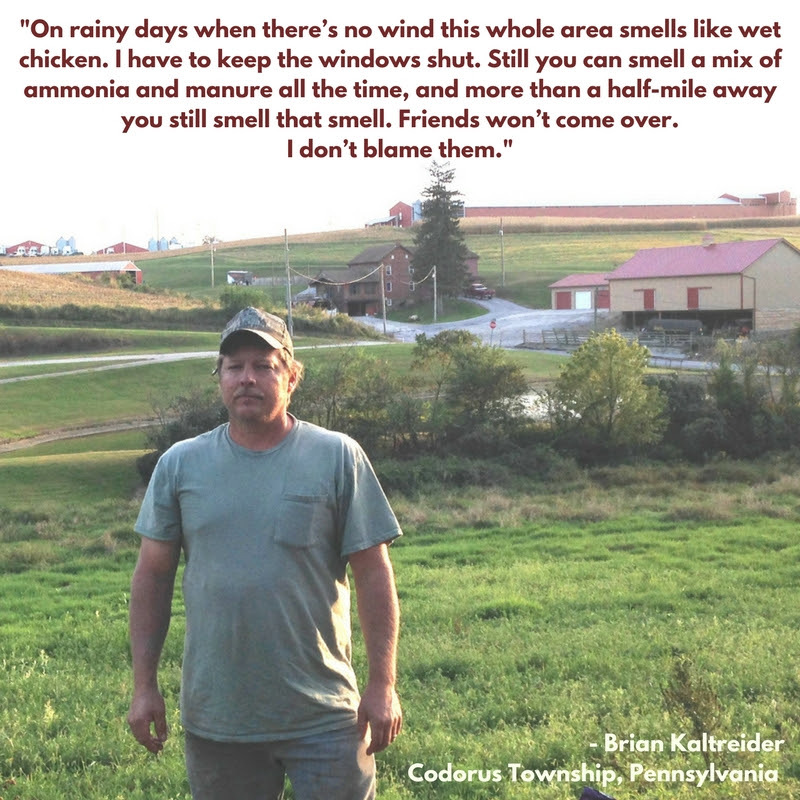 The larger Hillandale operation quickly disrupted lives, lifestyles, and livelihoods in Codorus Township, and soon residents were outnumbered by the poultry population, 4,000 to 1.3 million. The sights, sounds, smells, and signs of a major concentrated animal feeding operation (CAFO) quickly became unhealthy and unavoidable. A member of Codorus Township’s Board of Supervisors, Brian was getting some of the worst of it. My workshop was so filled with flies at one point that I had it gassed. After a little time we went back in to clean up. By the time we were finished, we’d filled up a five-gallon bucket of flies. Five gallons of black flies. It was unbelievable. Continue reading Brian’s story here. Boots-on-the-ground practical training, which will include training on using indicator test strips to determine whether more aggressive sampling may be warranted. For more information about our Water Rangers program or to find out if your community is elgible for the training program, please visit our website. Crawford County, Wisconsin April 22, 2017: SRAP Water Rangers Water Quality Monitoring Workshop. (Workshop is full and not accepting attendees.) For more information, contact Scott Dye ScottD@sraproject.org. Indianapolis, Indiana April 22, 2017: Indiana CAFO Watch will have a booth at Earth Day Indiana. You are invited to stop by and say hello. For more information, contact Barbara Cox at barbarasha1@msn.com.